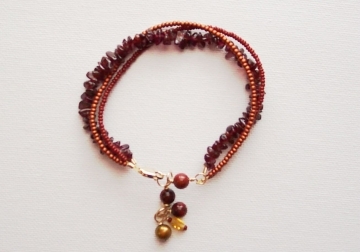 This richly colored, triple strand bracelet is very pretty, and best of all it is made with affordable glass seed beads mixed with real garnet chips and a "charm" of three beads--one yellow citrine, one golden pearl, and red jasper for an added designer's touch. I finished it with a 14KT gold-filled lobster clasp, which connects to a handmade "extender chain" of gold wire and three red jasper beads for accents. 1 clasp of your choice. For this bracelet I used a 14 KT gold filled lobster claw clasp. 3 strands - length of flexible beading wire (like Beadalon or Soft Flex) to fit the desired bracelet length, plus a couple extra inches to work with. 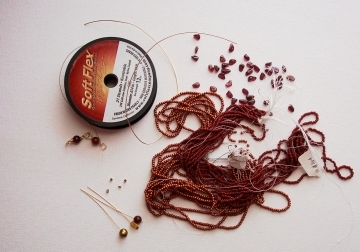 We will string three stands of flexible beading wires with beads. String two colors of seed beads on the first two strands, and garnet chip beads on the third strand. 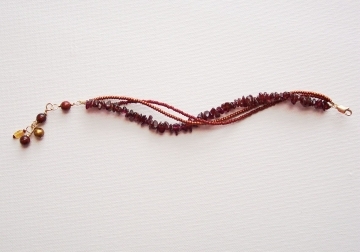 Make sure all three strands are exactly the same length and add or remove beads if necessary. We will make our own extender chain using the gold wire. Make a large loop with round nose pliers, and close the loop with a couple of revolutions of wire. 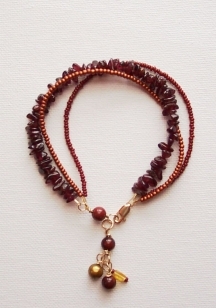 (See wire wrapping beaded chain instructions if you are not familiar with this technique), attach a red jasper bead, and make another large loop on the other side of the bead. Repeat this technique so you have two beads in your chain with large loops connecting them. Now, let's attach the charms to the other end of the chain. Slide the three bead charms (jasper, citrine and pearl) onto headpins, and attach them to the last loop in your chain using round nose pliers to create a loop. Now we will use a crimp bead to close the ends of each wire and attach to the clasp on one end, and the extender chain on the other. We are working with multiple strands, so you can use a crimp bead for each strand. You may crimp multiple strands using one bead if there is enough room to allow all of the wires to double back through. 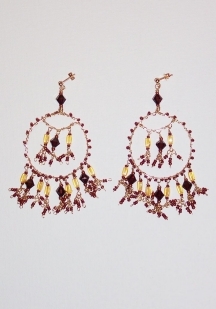 Try these amazing matching chandelier earrings for a complete set!